CI is pleased to inform you that Rajasthan, the largest stronghold of the Great Indian Bustard, became the first state to announce a plan to recover its critically endangered state bird bird. On June 5th, the state announced a Rs. 12 crore ‘Project Great Indian Bustard’, which is to be initiated this year. We applaud the government of Rajasthan for its momentous decision, and hope that other GIB range states will follow its lead. Conservation India thanks the over 1000 readers who wrote to the Chief Minister of Rajasthan expressing their concern. We also thank Rajasthan’s Forest Minister, Bina Kak, for her leadership in this matter. CI will track the implementation of this project and post updates from time to time. With less than 200 left, will this magnificent bird be the first mega species to go extinct in India since the cheetah? Or can it be pulled back from the brink of extinction, like the California condor in America? We are not crying wolf. A survey of recent literature — and discussions with experts — reveals that there may be less than 200 Great Indian Bustards (Ardeotis nigriceps) left in India. What’s worse, this tiny number is fragmented into small populations across several Indian states, making the bird even more prone to extinction. While it is welcome news that the Government of India is working on a species recovery plan, and that the state of Rajasthan has already prepared one, will the wheels of bureaucracy turn fast enough to stop the decline? Probably not, unless we raise the issue collectively. Already, the critically endangered bird has disappeared from over 90% of its former range. If urgent and targeted conservation actions are not taken immediately at specific sites where the Great Indian Bustard (GIB) still exists, the bird will almost certainly go extinct in the near future. The GIB is endemic to the Indian subcontinent, and, with hunting and uncertain conservation efforts in Pakistan, India is the last hope for the survival of the species. In this document we highlight what can be done to prevent this majestic flagship of our grasslands from disappearing under our admiring gaze. We believe that the GIB can be saved, but it will require concerted and coordinated action by the Central Government and GIB range State Governments, research institutions, NGOs, local community leaders and committed conservationists. In a recent judgment, the Supreme Court has directed the Ministry of Environment and Forests to take urgent steps for the recovery of the GIB among other endangered species. The time to act is now! A detailed paper about the ecology and conservation challenges of the GIB is attached for download. The paper is authored by experts on the topic who represent institutions – Wildlife Institute of India (WII) and Bombay Natural History Society (BNHS) — that have been working on a species recovery plan for the bird. The Great Indian Bustard lives in short-grass plains and deserts in large arid landscapes. It is now confined to only eight pockets in 6 Indian states — Rajasthan, Gujarat, Maharashtra, Madhya Pradesh, Karnataka and Andhra Pradesh. The largest population of about 100 birds (>50%) can be found in Jaisalmer, Barmer, and Bikaner districts of Rajasthan where it is the State Bird. Remaining populations number less than 30 birds each. It may be already extinct in Madhya Pradesh — there are no reliable current estimates from the state. State Governments must secure and fully protect all ‘lekking’ sites. This may be the single most important step in saving the species. A lekking site is a traditional place where males gather to display and attract females. If these sites are subjected to disturbance or degradation, GIBs may not be able to breed. Even if large areas of potential GIB habitat are protected, but specific lekking sites are not, GIB numbers will continue to be slide. Since there are multiple threats to these sites, such as industrial development, agriculture, irrigation and highways, this step needs political will and cooperation by multiple government departments and local communities. State Governments must constitute a GIB task force in every GIB state, with a handpicked membership that includes dynamic and committed government officials from different departments, biologists, conservationists, and local community leaders. MoEF must launch a full-scale ‘Project Bustard’ based on a sound scientific plan, and developed in consultation with national and international experts, as well as key people from each GIB state. Examine the feasibility of captive breeding by constituting a core group of experts that includes international experts with experience in breeding bustards or similar endangered birds in captivity (the recovery of the California condor, a large-sized, slow breeding bird that was on the verge of extinction, was a result of captive breeding. From 22 birds left in the wild, their numbers have increased to 405, with 226 living in the wild). Send out annual advisories from MoEF to Chief Wildlife Wardens of GIB States to prohibit entry and photography during the breeding season (Apr 1- Oct 31) at all known bustard habitats. CI believes that even disturbance outside the breeding season can have serious implications for the species and requests that wildlife photographers voluntarily desist from GIB photography. It will be an absolute shame if we allow this magnificent bird to go extinct. 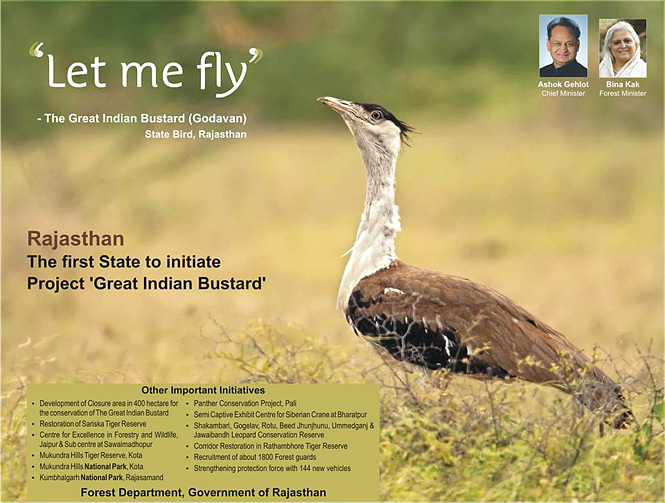 Since Rajasthan has the most viable population of this species, as well as abundant habitat, we recommend that you immediately write to the Chief Minister of Rajasthan, Mr. Ashok Gehlot, urging him to set up a ‘Bustard Task Force’ to look into short-term and long-term measures for GIB conservation. Proper measures in Rajasthan can make a huge difference to the survival of the species. This does not mean that other states with smaller populations are not important. CI will coordinate steps with other states and keep you informed on how you can participate. CI’s previous campaigns to highlight the plight of the Narcondam hornbill and the Amur falcon were extremely successful thanks to the number of people who participated in them and the media coverage that ensued. We request you to kindly publicise this critical issue so that we can save the great Indian bustard, a magnificent icon of our grasslands and deserts. In order to kick start this process, we urge you to immediately constitute a ‘Bustard Task Force’ (BTF) comprising hand-picked, dynamic officers from Forest, Revenue and Agriculture Departments, as well as scientists, conservationists, local community leaders, and committed NGOs, to work under the leadership of your Minister for Forests. The BTF should be tasked with implementing, improving and monitoring the State Action Plan for saving Bustards that was reportedly prepared by your government in November 2012. Chief Minister, you have it in your power to secure the future of your State Bird for posterity. Present and future generations will be immensely grateful if you take decisive and immediate action now. Saving Species -- RSPB It's not that great being a great Indian bustard!